Bust-A-Move is a well-loved puzzle game that has been ported to countless platforms since its debut in 1994. In 2009, Android got its own version, with the addition of a "challenge" game mode and the inclusion of special guest star (the Android mascot). As a huge Bust-A-Move fan, I initially downloaded the game from the Android Market with a T-Mobile G1, and despite the relatively high $4.99 price, I was happy to have it. 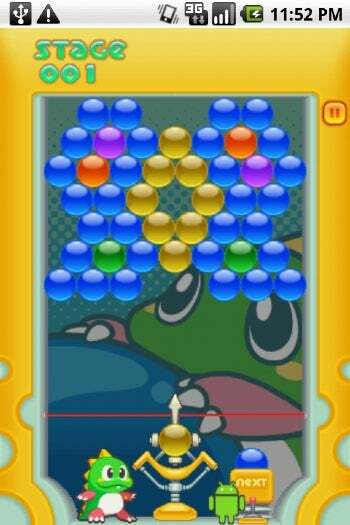 The graphics are cute, colorful, and on a par with those of other versions of Bust-A-Move. The controls are either trackball-and-touch, or just touch (drag below the red line to aim, tap above to shoot); both work fine. The challenge mode introduces a Tetris-like, never-ending board (rather than the distinct levels of the original), which is a fun way to test your endurance, if nothing else. Unfortunately, since its initial release--when the G1 was the only Android handset--Bust-A-Move has not been updated for newer phones with higher-resolution screens. For example, the Motorola Droid has a slightly different aspect ratio than the G1 does, and since the game is meant to be played in portrait mode I'm left with a persistent, ugly blank space at the bottom of the screen. The gameplay remains intact, so if you're a Bust-A-Move devotee, you may be willing to live with this shortcoming. However, I'd much rather see Square-Enix support the newer Android handsets, since at $4.99 the game is on the high end. Indie developers seem to have no trouble releasing constant updates for games priced much lower, so there should be no reason why Square-Enix can't do the same. Because the app is currently in a less-than-optimal state, I can give Bust-A-Move only two stars--but if by some miracle it gets an update, it would move up to a must-buy.